The crazy fusion of the wild west, dinosaurs, and robots is just not enough to make this game fun. 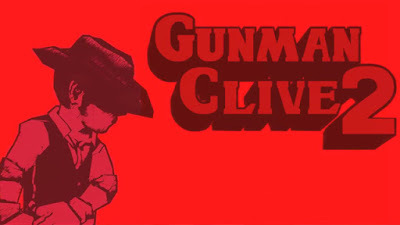 Gunman Clive 2 is the sequel to the very successful indie iOS(2012) and 3DS(2013) release Gunman Clive. The sequel was directed by Bertil Hörberg and developed by Hörber Productions in Sweden. It was released on 3DS in January of 2015. Since the former sold much better on the 3DS the sequel was promoted heavily on Nintendo eShop. The sequel is a clear successor to the original Gunman Clive incorporating the same style of game mechanics. 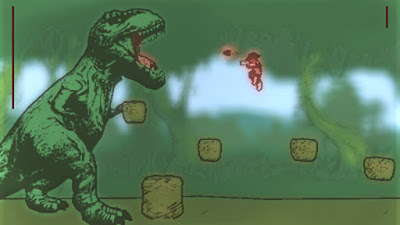 It has all of the challenging platforming as the first title, including gravity defying sections where the player is flipped from the ground to the ceiling. The game also includes sections where you even can ride a cute and cuddly panda or some forced perspective sections where you ride a horse. 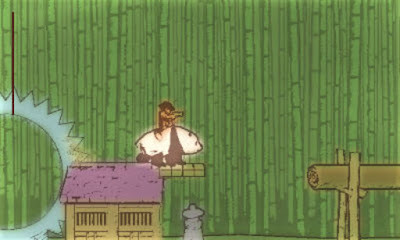 During the game you can play with characters other than Gunman Clive. All of the characters use guns that can be augmented by different pick-ups, such as spreadshots or missiles. Each character brings a different skill-set ala Super Mario Bros 2. The presentation of the game still has the same aesthetic of the first title. The strange mix of line art, cel shading, and flat colors may seem charming to some but to me they are very unappealing. At first I thought the look and feel of the game was interesting and it gave me hope that I had stumbled onto something great, but it was not to be. Even having 25 levels and an eclectic mix of six shooters, dinosaurs, and robots in a western themed world was not enough to save this game from being just… boring. In fact, the majority of the reviews I have watched overstate how awesome the game is, based on the fact that it combines those elements. It’s as if a six year pulled out a mess of toys and started telling a story. Unfortunately, the six year old probably had more fun than I did. This game is primarily a run and gun shooter reminiscent of Sunset Riders, and although I would go back and play SR any day, Gunman Clive 2 felt like a chore to get through. The platforming elements were lackluster and stiff and the gave overall was just more of the same. If you were a fan of the first one, you will probably enjoy Gunman Clive 2. If you are looking for your first arcade shooter to own on the 3DS, you might want to pass on this title. There are a lot of great reviews out there for Gunman Clive 2. If you were a fan of the first entry in the series then you will most likely love this game. However, if you are new to the series, you may want to pass for a better option. Then again, Gunman Clive 2 is only 3 bucks so it’s not a total loss if you don’t enjoy the game. Ultimately, there is nothing about this game that makes me want to come back and play it more. There is nothing about it that excites me enough to tell my friends to play it. It just wasn’t fun. Have you played Gunman Clive 2? Give us your own mini review in the comments below! Other reviews you may enjoy! This review was a combo effort between Mark Ball and Matt Hauenstein. They spend their days educating future generations in mathematics and the English language arts, and their evenings playing games and eating pizza while arguing about sports.